When Ovinomancer enters the battlefield, sacrifice it unless you return three basic lands you control to their owner’s hand. , Return Ovinomancer to its owner’s hand: Destroy target creature. It can’t be regenerated. That creature’s controller puts a 0/1 green Sheep creature token onto the battlefield. Spaar gratis BoM punten Verdien BoM punten met elke bestelling. Spaar BoM punten voor gratis producten of winkeltegoed. Oracle tekst When Ovinomancer enters the battlefield, sacrifice it unless you return three basic lands you control to their owner’s hand. 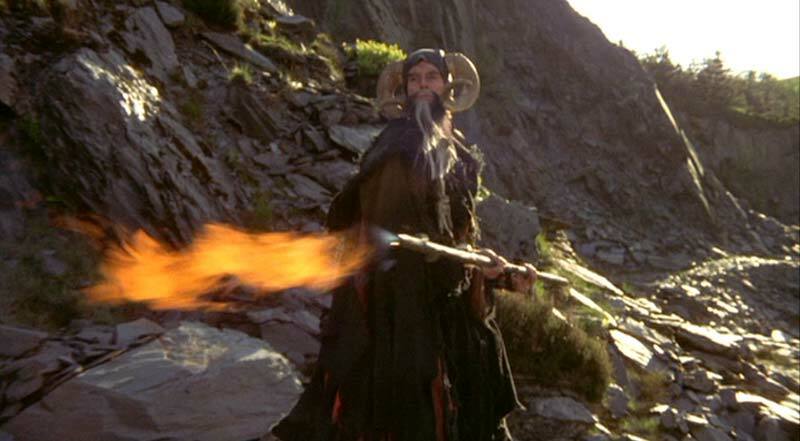 De bijnaam van Prodigal Sorcerer is "Tim", naar Tim the Enchanter uit Monty Python and the Holy Grail. Op deze naam zijn nog wat varianten gekomen. Zo is Prodigal Pyromancer "Tom" en Zuran Spellcaster is "Ice Tim" en Rod of Ruin "Tim-on-a-stick". Ook Ovinomancer refereert naar Tim the Enchanter: hij lijkt er erg op. Om te reageren op Ovinomancer dien je eerst in te loggen. In jouw voorbeeld is hij een sorcery; maar dan zou hij Emmy niet kunnen destroyen, dat kan deze (met haste) wel nu is hij namelijk geen targettende spell, maar een targettende ability. Niet errata, dat is een aanpassing aan hoe de kaart werkt Maar een trivia, zeker wel! Ik heb nu ff geen tijd, maar ik ga 'm erbij zetten! In the trading card game Magic: The Gathering the Prodigal Sorcerer card is often affectionately called "Tim", because of his ability to damage any target (as Tim the Enchanter summons fiery explosions anywhere). Recently, the nickname has broadened in definition, becoming a term for any card with the same ability as Prodigal Sorcerer. In the Planar Chaos set, in which many famous cards were shifted into different colours, a red version called Prodigal Pyromancer was released - and quickly earned the nickname "Tom". 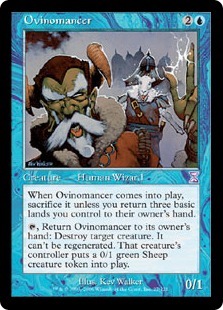 There is also a card called "Ovinomancer" that has art that directly references Tim the Enchanter, as the character depicted is an elderly wizard with a long beard and horned skullcap. Moet er bij deze kaart niet de errata dat de art refereert aan Time the Enchanter uit Monty Python and the Holy Grail? Maar deze is echt goed met haste! Stel, je hebt een Fervor op de battlefield. Je cast de Schapentovenaar en zijn 'enters the battefield' ability triggert. Reageer met zijn ability. Je bounced je Mancer en sloopt een beest. Daarna resolved de triggered ability en je kiest om de Mancer te saccen...maar die zit alweer veilig in je hand! Destroy target creature. It canâ€™t be regenerated. That creatureâ€™s controller puts a 0/1 green Sheep creature token onto the battlefield.